Wheels to Work West has a small fleet of new bikes available to loan in Lawrence Weston and Avonmouth, for people who need help to access work and training opportunities. If you have an employee or a potential recruit over 16 and a bicycle could help them access a new job, interview or job related training they may be able to borrow a bike. A fleet of new hybrid road bikes are available to hire for residents in Lawrence Weston and Avonmouth. Bikes will be hired with full kit including pannier bags, lights and locks. Cycle skills training and bike maintenance training will also be available on request. 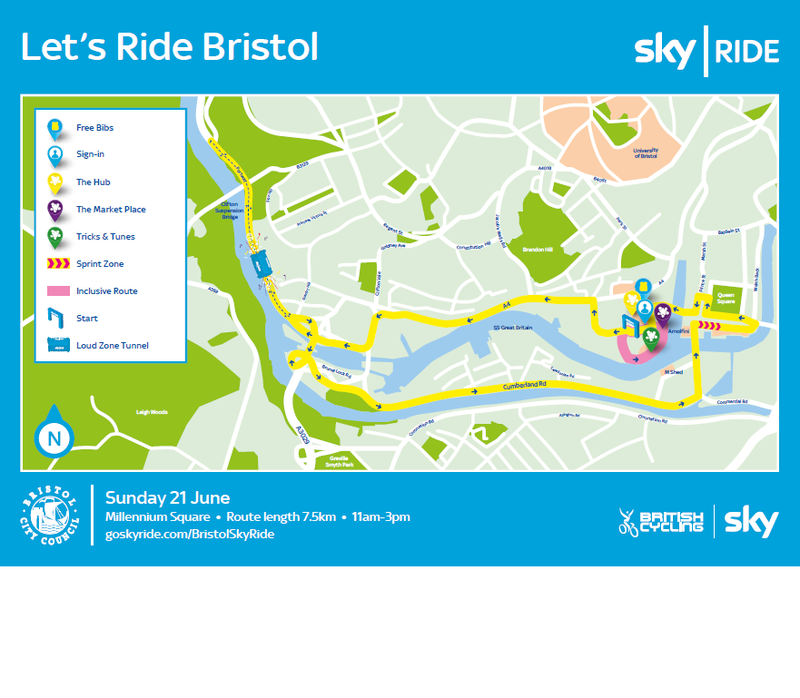 Bristol’s first ever SkyRide will be taking place on Sunday 21st June. Sky Ride Bristol has taken over from the successful Bristol’s Biggest Bike Ride and offers a unique family day out for all types of riders and abilities through traffic-free city centre streets with loads to do both on and off a bike. More info at goskyride.com. Download route map here. Please be advised that there will be works across the cycle footpath near Seabank at some point in / from the week commencing 16th March 2015. The path will not be closed, but there may be delays if there is plant working at the location when you arrive. This might be several minutes. We will let you know of any updates such as a more specific time for the work. Position identified below. Cable route to follow the red line, the nominal width of the trench is 500 mm and the working corridor is up to 10 metres in width other than where the cable runs in the public highway. Close up of crossing point within the yellow box can be seen below. St Andrews Road Proposed Walking and Cycling Route – what are your views? Bristol City Council and partners wish to improve access to employment sites across Avonmouth and Severnside. Research carried out by the University of West England, SevernNet and others has consistently highlighted poor access as a barrier for nearby residents to access employment, and businesses to access labour markets. BCC propose building a high quality walking and cycling route from the Portway Park and Ride site all the way to Cabot Park, along St Andrews Rd (the green route). This will help connect communities in Shirehampton, Avonmouth and beyond to employment sites in Avonmouth and Severnside. This 4.5km long path is not planned to be built in isolation but will act as a ‘spine’ for further improvements to transport in the area. Your views are important. This survey will take no more than 5 minutes to complete. Thank you for your time. We’ve just set up a BUG to help you connect with other cyclists across the area, share information and news, and let us know what would help make cycling more easy! That’s not to say we have a magic wand or a large pot of money … but there are a number of initiatives planned and opportunities to influence developments. If you’re familiar with facebook and/or twitter and would like to help us grow the group we’d love to hear from you. A new lockable cycle shelter has been installed on the South platform at Avonmouth rail station funded by the Local Sustainable Transport Fund in partnership with First Great Western and SevernNet. It’s unlocked at the moment so feel free to use it. Leaving the door unlocked, just lock your bike to a stand (restricts users to cheap bikes?). Fit a combination lock, registered users have the combination, rely on them to lock it after. Fit a padlock, registered users have a key, rely on them to lock it after them. Shelter unlocked by train guard at 6.20am and locked at 10.10pm (subject to agreement). Whatever you want, let us know! !